We have all heard the term, “fences make good neighbors,” right? Well, there is a reason for that. Fences add privacy to your yard. And no fence is better for that than…you guessed it, the Privacy Fence. These tall fences keep your nosey neighbors peering eyes out of your business, allowing you to live your life in privacy. Privacy: As we have already mentioned, privacy is the #1 benefit of the privacy fence. But you probably figured that out before this blog. Safety: A privacy fence is also great for keeping your children or pets safe, while also keeping intruders and wild animals out. Curb Appeal: Privacy fences are a great way to add curb appeal to your landscape. Home Value: A fence is also a nice way to add value to your home. Wind Barrier: A privacy fence will help cut down on the wind in your backyard, which is great for that homeowner that enjoys throwing parties and barbequing. Durability & Longevity: Privacy fences are built to last. 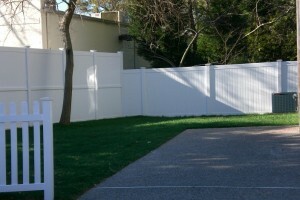 Noise Pollution: A privacy fence helps cut down on noise pollution. Privacy fences come in a wide range of styles and materials, but the two most popular remain wood and vinyl. Wood: Wood fencing provides a natural and rustic look to complement your home. Vinyl: Vinyl fencing has become very popular because of its clean appearance and long product life with minimal maintenance. For more than 50 years, Hercules Fence has been providing exceptional fence services to the people of Northern Virginia and the surrounding area. If you have any questions about The Many Benefits of a Privacy Fence, please contact Hercules Fence of Manassas, Virginia today by calling (703)551-2609 or visiting our website. Also, check out Hercules Fence of Manassas on Facebook,Twitter, Google+ and YouTube! This entry was posted on Friday, May 31st, 2013 at 4:43 pm. Both comments and pings are currently closed.